Sallisaw police and Sequoyah County deputies conducted a drug investigation at Interstate Circle #23 in Sallisaw on Jan. 30, and took six into custody. As of Monday, five of the suspects have been charged in Sequoyah County District Court in Sallisaw. Darrah Shay Billie, 19, who is listed as homeless, was charged Feb. 6 with unlawful possession of a controlled drug with intent to distribute and a misdemeanor charge of unlawful possession of drug paraphernalia. She entered a not guilty plea to the charges on Feb. 8 and is free on a $31,000 bond. Her next court appearance is set on March 14 on Associate District Judge Kyle Waters’ disposition docket. 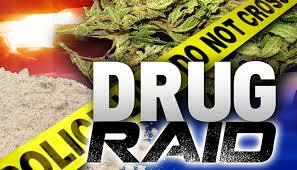 Laman Rowell, 18, of Sallisaw, Joseph Bradshaw Pack, 20, of Vian, Billy Dean Rowell, 60, of Sallisaw, and Mark Thomas Wilson, 24, of Sallisaw, were all also charged with unlawful possession of a controlled drug with intent to distribute and a misdemeanor charge of unlawful possession of drug paraphernalia. Laman Rowell entered a not guilty plea to the charge on Feb. 9, and his next court appearance is set for March 14 on Judge Waters’ disposition docket. He is free on a $15,000 bond. Pack entered a not guilty plea to the charges on Feb. 8 and he is also on Judge Waters’ disposition docket on March 14. Billy Rowell entered a not guilty plea to the charges on Feb. 8, and he is also on Judge Waters’ disposition docket on March 14. He is free on a $15,000 bond. Wilson entered a not guilty plea to the charges on Feb. 7 and he is on Judge Waters’ disposition docket on Feb. 28. A female juvenile was given into the custody of a family member, and another male found at the residence was not arrested, according to court records. According to the investigating officer’s report filed with the charges, investigators found several glass and metal smoking devices with a burned residue, a .357 hand gun, several hand-rolled cigarettes, an envelope containing $4,880, a safe with $3,800 in cash, two sets of digital scales, several containers with a green, leafy substance, and numerous pills. The green, leafy substance was identified as marijuana and the pills were identified as Clonazepam, Oxycodone and Hydrocodone.